SO THANKFUL. That’s how I’m feeling right at this moment. We’ve had a long, hard 6 weeks with our little man Deacon. 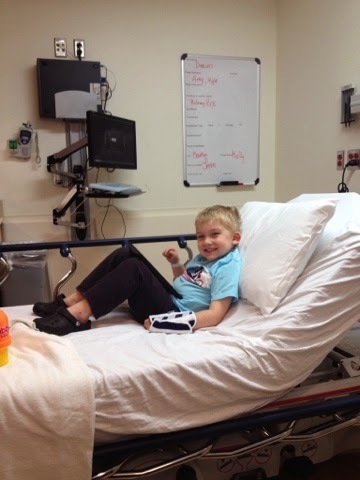 To recap… I brought him into the emergency room back in March for severe joint pain in his ankles, knees & elbows. He couldn’t even walk! And then he broke out in a scary rash on his legs. They diagnosed him with HSP which is something I’ve NEVER heard of. It’s an auto immune disorder that attacks his blood vessels (thus the rash & joint pain). But it also caused him severe stomach aches and vomiting. After about 2.5 weeks of pain and suffering he was feeling MUCH better. I’d say the rash started going away at the 4 week mark. In those weeks his pediatrician continuously ordered urine samples to check on the blood & protein in his urine. That is a common side effect of HSP and can be severe and cause kidney damage. Unfortunately the amount of protein & blood did get to an alarming level and we were referred to a kidney specialist at the Children’s hospital down at the UofM. She looked at him and ordered more blood tests & urine samples. After that she said she wanted to look into it further which would mean a kidney biopsy. 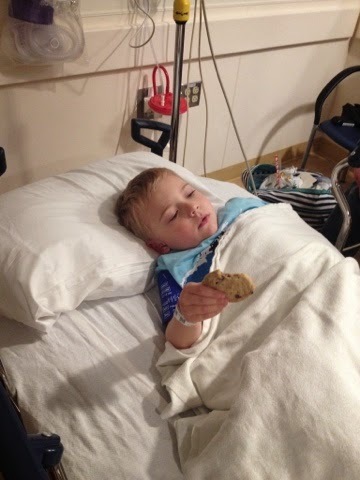 Last Friday, May 8th, we went in for his biopsy which they had to put him under for. The staff/doctors/nurses at the hospital were AMAZING!! Deacon was greeted with toys, treats, ipads, games, and happy smiling faces. Since he hasn’t been in pain for a while and doesn’t really understand what was going on or why he was there.. he thought it was a TREAT!! 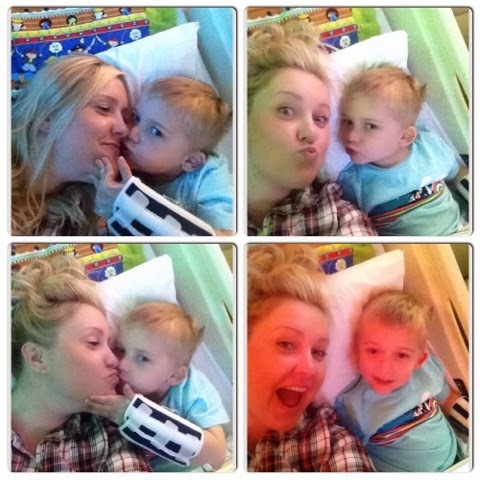 His overnight hospital stay seemed like a vacation to him! Getting waited on hand & foot. Getting to order pancakes for breakfast and lay in bed all day watching movies. He did AWESOME. The nephrologist discharged us the next morning and told me he cannot be active for 2 weeks. SERIOUSLY?!?! How do you keep a 4 year old from being active?! He’s a ball of energy!! Of course he reassured me.. ‘just do your best’. We know he’s a 4 year old boy. Unfortunately that means a little more screen time than I’d like. So after anxiously awaiting the biopsy results I got a call from the nephrologist (kidney doctor) last night. She said he had the most minimal amount of kidney inflammation she’s ever seen from a biopsy and didn’t see any other signs of other bad things she was looking for either. WOOHOO!!! The entire point of the biopsy was to see how inflamed his kidneys were so we could make a treatment plan. For sure the plan was to put him on steroids but the biopsy would tell us how much and for how long. I can’t even tell you how happy I was when she said ‘at this time I don’t want to treat this. Let’s let it get better on its own.” HALLELUJAH!!! This was EVEN BETTER results than I was praying for!!! Steroids are no fun to be on and have icky side effects. So thankful. But after all the stress & anxiety we’ve gone through (my hair has literally been falling out) I immediately put things into perspective at the hospital. When you talk to other parents who have been there with their sick child for weeks, or worse, months… our overnight didn’t seem so bad. 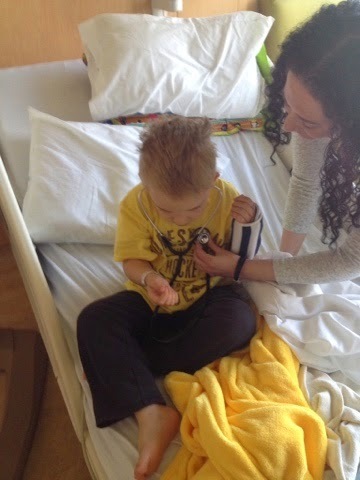 And one of my friends little boy, Silas, just days older than Larsen (5 months old) was fighting seizures and diagnosed with infantile epilepsy. They need our prayers!!!! Jesus walked on water.. he can heal these babes! 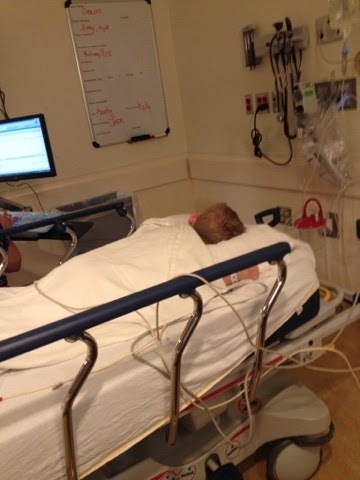 Deacon and I cuddled in his hospital bed that night and I just loved on him and knew that whatever the results were on that biopsy.. we would get through it. We are SO grateful and thankful for a loving and merciful God. And thank you to whoever reads this and prayed for Deacon!! And if you’re reading this.. please pray for baby Silas!! He ALWAYS asks if he can listen to his heart beat too.